He is Sonam Dargye's disciple. He used to follow Sonam to protect the broad Hoh Xil [Kekexili], and left after Sonam's death. Now he comes back, establishing a NGO to teach local herders to protect the environment. Sonam Dargye came back to his hometown for a summer vacation. He studied in Qinghai University for nationalities, as the first college student from his village in Yushu Tibetan Autonomous Prefecture, western China's Qinghai Province. The tall young man in white shirt and blue pants always talked about the outside world in fashionable words and sometimes played the flute in his tent. Outside the tent, then a primary school pupil Tashi Dorje looked at him with envy, for this college student represents the world full of magic. Tashi, an orphan since he was only eight, wanted to be a man like Sonam Dargye. Years later, after graduation, Sonam gave up the opportunity to go to Xining, the capital of Qinghai Province or Beijing, and became a teacher in Zhidoi [Zhiduo] County National Middle School. Sonam rode back on a horse and took Tashi to the school, which for the first time changed his life. From Middle School to Qinghai University of Post and Telecommunications, Tashi's vision was broadened by seeing the outside world. To the young Tashi, the 1980s was in an age of idealism, and the society had undergone tremendous changes. What he had experienced in Xining inspired him, and he wanted to go back and change his backward hometown. Nevertheless, the reality crashed his dream again and again. No matter during the reform of the post office or in the school where he worked, his failure repeatedly. He began to doubt whether he had gone a wrong way in his life. At that time, the Zhidoi County Committee founded the Western Working Committee and was recruiting staff from the whole society. The secretary was Sonam Dargye, then Vice Secretary of the County Party Committee. Tashi and his friends rushed to Sonam, but were scolded by him, for Sonam thought they were too weak to stand the frustrations. To Tashi, Sonam was hot-tempered, but he was still willing to follow Sonam. Tahi then joined the working committee and became the secretary of Sonma. In the next 18 months, he entered Hoh Xil for more than 12 times. 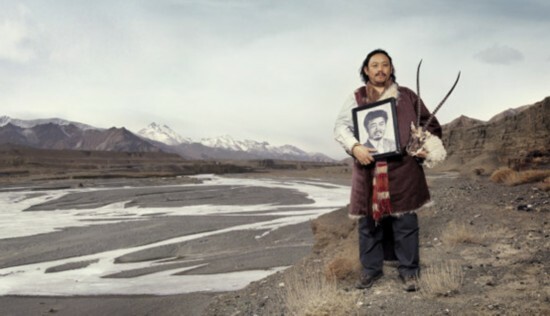 Sonam has become a Tibetan hero for his contributions to the environment, and a symbolic figure. The legends about his protecting Tibetan antelopes have been well known with the movie "Kekexili" directed by famous director Lu Chuan. In Tashi's consideration, maybe it is the environment of Hoh Xil that attracted Sonma, for he is a man with clear-cut individuality, who can not adapt to the atmosphere. And he is a lonely hero. Even to his student Tashi, he had never put on a warm face. He was more like a pride eagle, and would never win people’s respect by showing his kindness. Even as a local resident, Tashi had never imagined horrible environment of Hoh Xil: on the third "no man's land" in the world, there are no traffic, no people or order but desert and poachers. Seeing the densely printed wheels entering Hoh Xil, Sonam signed, "This is not 'no man's land' but 'no law's land'". In January 1994, Tashi and Sonam entered the Hoh Xil together for the last time. In the middle, to look for poachers, the only team leader Sonam went alone for an investigation. Tashi was worried about his safety, so he drove a truck to follow Sonam, who scolded him. Sonam blamed Tashi for not following his lead, while Tashi thought he should not be blamed. They even had a fight. Finally, Tashi made his decision: for the last time, he would see goodbye to Sonam and Hoh Xil. In the next morning, seeing Sonam packed difficultly, Tashi felt embarrassed: Sonam worked hard here for nothing, but he himself treated his teacher so bad. Then he saw Sonam took out a pill and chewed. Though Sonam was only 40 years old, his health had been damaged by the harsh environment. Sometimes, Sonam was seen tossing in the car for the pain in his stomach. Seeing his teacher’s suffering, Tashi went in front of him and apologized. Sonam, however, turned around and said, "Go for your bright future and we will go in separate ways here." As the team members were moving on, they came across a large number of poachers. After a gun battle, all the poachers were captured. With a stern face, Sonam said to Tashi, "Take my coat." Hearing that, Tashi was excited: after all, Sonam had not ignored him any longer. To take care of the wounded, Sonam asked Tashi and a driver came back and he would stay with the other two guys and patrol on. In the team, Sonam was not only a leader, but also a big brother to take care of other members. Sonam told Tashi how to go out of the desert by looking for direction and warned the poachers who went out with Tashi, "If you dare to touch him, I would follow you till my next life." Tashi was moved, so he made a decision to follow this man for the rest of his life. Nevertheless, he had not known that they would depart here forever. When the last drop of gasoline was exhausted, Tashi arrived at the hospital. Meanwhile, in the gun battle with poachers, Sonam was shot to death like a Tibetan antelope. In the bitter cold environment, he was turned to an ice sculpture with the position of shooting. Sonam left and took Tashi away. To Tashi, he lost his teacher, leader and missed his way once again. Zhaba Dorje, Sonam's brother in law, came. He used to become head of Bureau of Public Security and President of Institute of Inspection, and then become Deputy Director of Law Committee of the regional people' congress. Influenced by Sonam, he came and established a team to protect Tibetan antelopes, which was the famous “Wild Yak Team”. Tashi didn't join the team. His entry into Hoh Xil without knowing anything about it was completely attributed to Sonam Dargye. Till today, when talking about what had happened in Hoh Xil, Tashi said in a calm tone and he never considered himself as a hero. "I wanted to leave, even when Sonam was there, but I stayed for him", he said. The Hoh Xil was terrible and he was frightened. Every time when he left for Hoh Xil, he behaved as if nothing had happened, but he didn’t know whether he would see his family again. In Hoh Xil, every one they met would be a poacher and every time, they would face a life-or-death struggle. Tashi felt tired. He wanted to change and left. He came to Xining for reading. During that period, he made a lot of friends, and one of them is Yang Xin, the founder of "Green River" (a well-known NGO in China) and famous environmentalist. Hearing the stories of Sonam Dargye, Yang came to Hoh Xil with reporters from Beijing Youth Daily, and helped to establish the Sonam Dargye Natural Protection Station. For the first time, Tashi knew that environment could be protected in this way. And also for the first time, he knew the existence of NGO, and made friends with people from other countries. His horizon was broadened. He got to know the word "ecology" and he thought it was what Sonam did in his lifetime. After finishing his book Ecological Economics at the library, he wondered if it would be beneficial to the animals, water, economy if the mode of ecological economic is established in my hometown. His thesis was titled "Assumptions of the Ecological Protection in China Ecological Preservation Areas around the Yangtze River". Professors even couldn't believe he had finished the thesis by himself. After over an hour of oral defense, one professor said to him repeatedly, "Don't give up". Before Sonam's death, he was always seen reading the book List of Endangered Animals. "Why did he read the book from time to time? What was Sonam thinking of at that time?" Tashi asked himself. Back to Zhidoi County, Tashi and his friends established the "Three Rivers Cradle Ecology and Economy Association". Like Sonam, he was appointed as secretary of Zhidoi County Party Committee. With foreign friends he knew in Xining, Tashi sent medicine to local pastoral areas. He also helped to establish new "tent schools" and applied funds from overseas foundations. In the high schools for nationalities, he set up "Sonam Dargye Environment Education Center", and opened the environmental programs on Qinghai-Tibet Plateau for the first time. With the support of NGO "Friends of Nature" and "Plateau Perspectives", Tashi held a large-scale activity to train Tibetan teachers in primary and secondary schools. In a small and old hotel, Tashi walked on the platform in front of the over thirty people. Staring at them, he couldn’t say a word, but muttered to the depart Sonam, "See, I didn't desert you since we separated. I followed your footsteps and I made it. I would affect the entire plateau with a spark. Do you see that?" The association established by Tashi and his friends have carried out a lot of projects, circling the environment protection around the "Source of the Three Rivers" in the south of China (the Yangtze River, the Yellow River and the Lancang River). Different from other natural protection organizations, Tashi attached importance to the establishment of "green communities". As the customs and religion of Tibetan people fit the ecological protection naturally, the main job for the association is to teach the local herders how to protect environment. Firstly, through green compensation, villagers can decide how to operate and work. Compared with giving money directly, the local residents prefer to have the right to protect environment by themselves. Secondly, "tent schools" were established to train local cadres with interests of environmental protection. Thirdly, the mobile vans were used to raise environment awareness. The NGO members would attract audience by showing a film and give the herders DV and ask them to shoot, and show them what they have got after cutting. In addition, there is a project named "Green Health" to train doctors for local residents. Another project named "green responsibility" is to fund students from needy families. The beneficiaries are asked to carry out public benefit activities. The most well-received project of the NGO is "to keep the last piece of pure land": edition of books about the relative laws on illegal mining and education activities. This series of booklets are mostly written in Tibetan language and in Tibetan style. They collect Tibetan proverbs, introduce to herders what the illegal mining is, list the relative laws, tell the herders to solve problems through media exposure, and give the cases and hotline telephone numbers. It is still difficult to carry out the natural protection work. Limited by realties, many activities cannot be carried out. For example, the altitude sickness would drive a lot of people away. The language barrier is also a big problem. But to Tashi and other members of the NGO, this land is their hometown. Standing at the plateau, he is not secretary, nor leader of the NGO, but the son of this land. He made a lot of friends in every village and the villagers would ask him for help whenever they came across troubles. He was asked to present every kind of celebration activities. Tashi would always be there and he said it was an honor to him. Tashi wore a string of beads on his wrist. For these years, Tashi has been to several foreign countries and the wonderful world has amazed him again and again. Nevertheless, the longer he has stayed in foreign land,the more he longed to go back to his home on the plateau. He likes the kind of unfettered feeling. After travelling around the world, Tashi returned to the original starting point.